Since the Philadelphia 76ers last won a basketball game -- eight weeks ago, Wednesday -- the Winter Olympics began and ended, Russia became a credible threat to invade a sovereign state, an airplane disappeared and approximately 21 million new infants were brought screaming into the world. But with Thursday's 120-98 loss to the Houston Rockets, trivia was elevated to history. With their 26th consecutive loss, the Sixers tied the post-LeBron James 2010-11 Cleveland Cavaliers for the longest losing streak in the very long history of the National Basketball Association, a history which encompasses roughly 53,000 regular-season games spaced over 69 seasons and 12 presidential administrations. Springfield, Mass., here they come. Scott Halleran/Getty Images Even the players can barely watch as another "L" hits the record books for Philly. But Philadelphia's lack of basketball sense -- the Sixers played defense like a family of wobbly kneed fawns as their opponent broke 100 points in the third quarter -- was, with respect to narrative, outmatched by its sense of the moment. The Sixers had the presence of mind to begin this streak on the precise date that would tee up the record-tying loss in Houston, against a Rockets franchise the Sixers, however impractically, aspire to become. The Rockets play fast -- or did before Dwight Howard came to town -- shoot 3s with abandon, have a surfeit of productive and cheap labor pocked from the draft's second round and have not one, but two legitimate superstars on their roster. Oh, and not for nothing, they're contenders. This is Philadelphia's blueprint for the future. When Sixers general manager, and former Rockets assistant GM, Sam Hinkie sat in the executive suite on Thursday -- or wherever he was -- he had the unique experience of watching a great thing he had a hand in building toy with what he hopes to build in its image. "Someday," you can imagine him saying to himself. But not today. As it was, the gulf between the two franchises could not have been more marked. The game was a study in contrasts. Houston started James Harden and Howard at shooting guard and center, respectively. Philadelphia rolled out James Anderson and Henry Sims, respectively. When Thaddeus Young hazarded a drive to the basket in the first quarter, with the Sixers already trailing by nine, he was blocked and knocked to the floor by Houston's powerful center. As Young lay dazed on the opposite baseline, the Rockets scored again to take a 28-17 lead. To imagine what the Sixers would be reduced to if he'd stayed down, or been traded at the deadline, is to contemplate a deep darkness. Young left the game, then returned, but it made little difference. The band marched on. By the fourth quarter, with the outcome long since decided, the Sixers stuck to their rotations while the Houston starters laughed on the bench and tossed T-shirts into the stands. A buzzer sounded and history was made, or tied at least. Sixers coach Brett Brown was philosophical after the loss. He's been very philosophical lately. "We move on. We're on a different path," Brown told reporters. "We see this whole thing through a far different lens." Through this looking glass, what the Sixers see is a bright future, a roster stockpiled with the raw talent, the megawatt star power to rival any organization in the association. Michael Carter-Williams, wreaking havoc as a 6-foot-6 floor general with smarts and instincts. Nerlens Noel as the elite rim protector. A 2014 lottery pick lighting up the scoreboards while an arena of fans clad in his jerseys roar until they're so hoarse they have to call out of work the next morning. And titles, definitely titles. But first things first. The Sixers still have to lose a bunch of basketball games, get good draft picks and use them judiciously. Phase one, so far, is going swimmingly for Philly. "We've been very transparent from day one that we were trying to grow something and build something," Brown said postgame. "The short-term pain, which we hope will produce a long-term gain, we think will fade to a distant memory in September." It can't anymore, coach. The 2013-14 Philadelphia 76ers now belong to the record books. MVP: James Harden. Harden did it all tonight -- scoring, setting up his teammates and hitting the glass. He finished with a triple-double -- 26 points, 10 rebounds, 10 assists -- and helped the Rockets get a not-so-difficult victory over the Sixers. He did it all in 31 minutes of action, too. historic: The Sixers have now tied the NBA record for the longest losing streak, and only a Detroit Pistons team stands between them and having the record all to themselves. The Sixers kept it relatively close in the first half, but once the second half hit, they couldn't contend, and the steak continued. X factor: Dwight Howard was 6-for-6 from the field and posted a double-double with 17 points and 13 boards in only 26 minutes. No one on the Sixers roster could match up with him physically, and he took full advantage. MVP: Chris Paul controlled the game for the Clippers, posting a quiet 31 points along with nine assists. When the Mavericks jumped out to double-digit leads in the second and fourth quarters, Paul led the charge, willing L.A. back and walking away with the win. LVP: Monta Ellis and Dirk Nowitzki shared the burden against the Clippers. Ellis shot a putrid 4-of-19 from the field, while Dirk had a terrible fourth quarter, missing all five of his shot attempts and three of five free throws. X factor: The Clippers hit 22 of their 25 free throw attempts, while the Mavericks missed from the charity stripe early and late, connecting on only 19 of 27 shots. In a game decided by the final possessions, those misses and makes made all the difference. MVP: LaMarcus Aldridge, who was playing his first game since suffering a back injury on March 12. 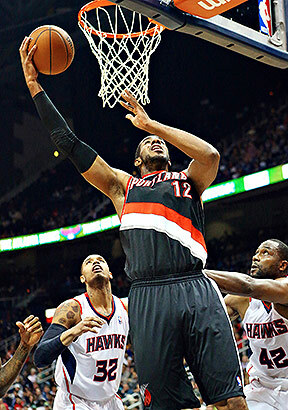 LMA showed no signs of being hurt, putting up 25 points and 16 rebounds in the Portland victory. X factor: Portland had buzzer-beating 3-pointers at the end of each of the first three quarters. Mo Williams hit one at the end of the first, Wesley Matthews hit one before halftime and Damian Lillard capped it off by hitting a deep 3 at the end of the third quarter. LVP: Atlanta's Paul Millsap did not have a great shooting night going up against Aldridge, Thomas Robinson and Robin Lopez. Millsap was 3-for-15 from the field and scored only 10 points for the Hawks. MVP: Brandon Knight. The Bucks guard made 12 of 21 shots on his way to 30 points. His jump shot with 21 seconds all but clinched a Milwaukee win that pulled the Bucks to within one game of the 76ers in the standings. LVP: Jeff Adrien. The Bucks acquired Adrien in a trade with Charlotte with the hope that he would be an unmovable rebounder in the paint. Jordan Hill moved him out of the way all game long. Hill's nine offensive rebounds propelled him to 28 points. sloppy: In a game between two teams with little to play for, the Lakers and Bucks committed a total of 38 turnovers. Kent Bazemore and Kendall Marshall had five each to combine for half of L.A.'s 20 miscues. James Harden, Rockets: The Sixers had every reason to fear the beard Thursday night in Houston, as Harden poured in 26 points, 10 rebounds and 10 assists for his second career triple-double. He did all of his damage in only 31 minutes of action, sitting the entire fourth quarter. Streaking Sixers: With their loss to the Rockets, the 76ers matched the NBA record for most consecutive losses, tying the 2010-11 Cavaliers' mark of 26 straight defeats. Philly will try to avoid owning the record outright on Saturday when the Pistons come to town. "We are on a different path. We see this whole thing through a far different lens." -- Sixers coach Brett Brown, on his team's 26th straight loss Thursday night in Houston. AP Photo/Curtis Compton Returning to the court after missing seven games with a back injury, LaMarcus Aldridge lifted Portland with 25 points and 16 rebounds in a win over Atlanta. During their 26-game losing streak, the 76ers have led in the fourth quarter for all of 20 seconds. Those were the first 20 seconds of the fourth quarter against the Orlando Magic on March 2.